Gone are the days when blog buttons were made to only “accessorize” or add a dash of personality to a blog or website. These days, blog buttons are created to express personal advocacy or a cause. They are called statement buttons. At Squeesome Designs, they do personalized and unique statement buttons apart from web designs and various other services. They also offer premade blog badge, word arts, sidebar titles, and statement buttons for free. If you are a breastfeeding mom who also blogs you’ll be proud to wear this awesome badge that supports breastfeeding in public. There are actually more cool buttons to choose from. If you are a bookworm, a coffee addict, a food lover, a travel buff, a green living mommy, etc? Squeesome Designs has made something that suits you. I‘ve already picked some buttons for my blogs and still want to add more. Thanks Squeesome Designs. They’re simply awesome! Feel free to visit them anytime and grab a button or two. Squeesome Designs only requests that you retain the link back to their site for others to find these blog freebies too. 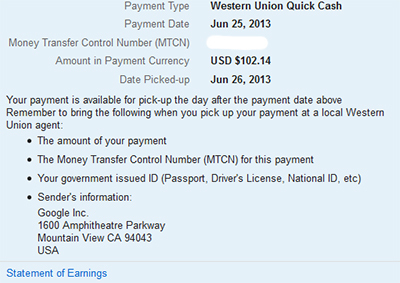 After 48 years er 4 years, I finally received my first payment from Google Adsense. I went to the nearest Western Union branch in our area upon receiving the MTCN or Money Transfer Control Number from Google. It took me only a few minutes to get the cash. I just filled out some documents, presented two IDs and the MTCN number to the WU staff and it’s done. I hope my next transaction (hopefully not another four years) will also be hassle-free like this one. I’m counting the weeks before I finally get my first ever payment from Google Adsense. If I may recall, it was in 2009, the same year when I set up my first personal blog that I started earning as ad publisher. Now, after four long years, I will be able to reach the payment threshold. I’m just hoping that I won’t encounter any problem similar to payment hold or worse cancellation of account. I heard sad stories from friends who experienced problem with their account. And then there are happy stories of those who regularly receive their checks from Google Adsense. I will be happy to share my own experience with you once I get the check.